Social media buttons are ineffective, damage site performance and distract from primary actions. Fortunately there is a better way. So your client or boss wants their website to have social media buttons. They want buttons asking people to share. They want buttons asking them to follow. They want buttons everywhere. Bright, gaudy buttons that stick out like a sore thumb. What do you do? What you must not do is complain that they ruin your beautiful design. The client just won’t care. Instead you need to present them with a solid argument and a viable alternative. So other than ruining good design why our social media buttons a bad idea? Clients love social media buttons, but they are a bad idea. I should come clean at this point and admit I despise social media buttons. In my opinion they achieve nothing and yet cause significant damage. Let’s begin with the damage they cause. Even if social media buttons were effective, the price you pay is too high for what is a secondary call to action on most sites. Rarely do you come across a site where the primary call to action is for a user to follow you on a social network or share your content. Even on a news site or blog there are other priorities. Priorities such as encouraging users to subscribe or click on an advertisement. All social media buttons do is distract the user from completing your primary call to action. This means that all social media buttons do is distract the user from completing your primary call to action. This is because social media buttons have the brand of their network and tend to stand out from the design of your site. Not only that, they clutter the user interface taking precious moments of user attention. Admittedly this is only momentarily, but when user attention is so scarce you need to be careful. But being a distraction is not the only damage they cause. Because the social media icons load from a third party server they can have a significant performance impact. They could also cause validation errors and security issues. Loading in social media buttons has a significant impact on performance. You might be able to overlook this if social media buttons were beneficial to either the user or the business. Unfortunately this is not the case. Social media sharing buttons offer little benefit to users. Copying and pasting a link into a social media update is not much slower than clicking a button on a website. In fact for users of Twitter who run the native application it is faster. When clicking a link on a website they will have to login. Something they do not need to do with their native application. From a business perspective social media buttons do not work either. On the rare occasions social media is the primary call to action on a website, having a few small icons is completely inadequate. These buttons do nothing to motivate the user to take action. They do not explain to the user the benefit of following the organisation. Or why they may want to share a piece of content. But it is easy to criticise social media buttons. If we are going to ask our clients to forego them we need to offer a viable alternative. Social media buttons come in two forms. There are the sharing buttons and the follow buttons. Both can perform valuable roles if implemented well. The secret is in timing and ease-of-use. Take for example how sharing buttons are often implemented. It is not unusual to come across a website that includes sharing buttons on every page of the entire site. This means the user is in the bizarre position of being asked to share privacy policies and terms and conditions! These buttons should only appear when appropriate. Instead of appearing across an entire site only use social media buttons sparingly. They should operate as integrated functionality within the website and provide real value to the user. Social media functionality should be integrated within the website and provide real value to users. Take for example this website. I don’t have sharing buttons appearing across every page. Instead I associate them with the pull-out quotes found in an article. This suggests content worth sharing and makes it easy for the user to do so. With this approach the user does not have to think about what they say. They can just click a button and share quality content. Of course, they have the option to edit if they so wish. A similar more thoughtful approach can also enhance follow buttons. There are two problems with your average follow us button. First, nobody comes to your website with the intention of following you on social networks. This means they are trying to do something else and you should not distract them. Picking your moment is crucial. Second, most websites provide no reason for the user to follow them. Instead the user is just presented with a generic “follow us” button. Imagine for a moment you were visiting a website to buy a new piece of software. The first thing you see when you arrive on the website is a gaudy follow us button. At this point in your journey this is not what you want to see. You are more interested in purchasing the software. But, once you have completed your transaction you will find yourself on a thank you page at the end of the checkout process. Because you have now achieved your goal you are much more receptive to another task. Now is a great time to ask you to follow the company on social media. It is not enough to ask users to follow you. You need to give them a reason. To make this even more compelling it would help if the software developers gave you a reason to follow them. 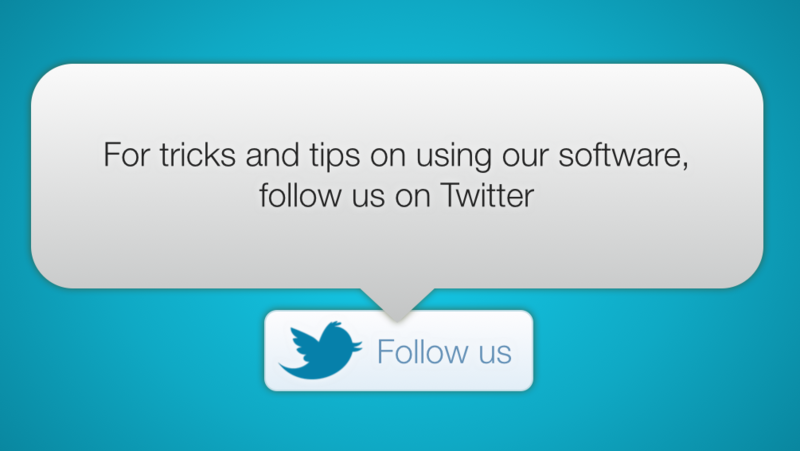 For example they could say “follow us on Twitter for tips and tricks on getting the most from our software”. They could even offer an incentive such as 10% off the pro version for people who follow them on twitter. My point is that just slapping some social media buttons on your website is lazy and not particularly effective. Your website should be encouraging people to interact with your brand via social media. But there are much better ways of doing it than a row of social media icons. Next time your client suggests using social media buttons offers them a more effective solution. It is a lot better than complaining they look ugly.